When consumer Google+ shuts down on April 2nd, consumer users running a Hangout on Air or Hangout video call from Google Calendar will almost certainly lose access to third party apps like Hangouts Toolbox and Control Room. It is not clear whether G Suite accounts will still have access to these apps. 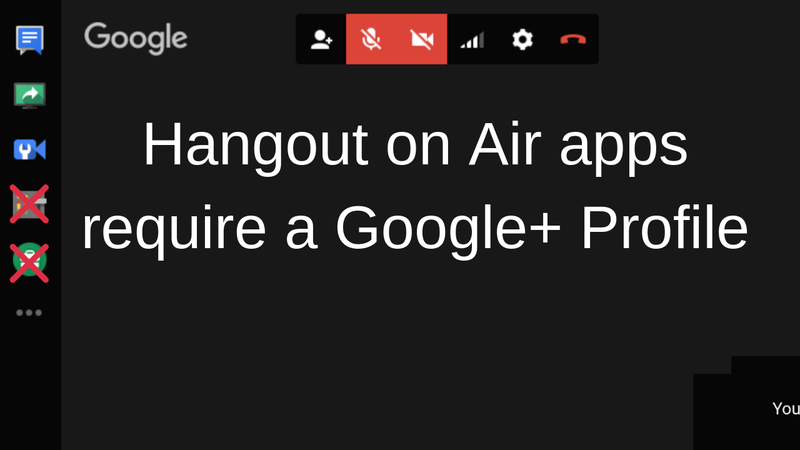 While there currently isn't any notice inside the Hangout on Air interface, I've personally confirmed that deletion of the Google+ Profile on an account makes the apps disappear and the option to add new apps is removed.. 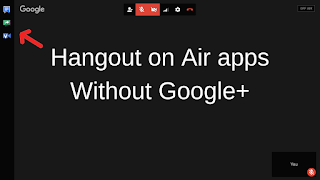 In April 2017 Google stopped supporting the Google+ Hangouts API. 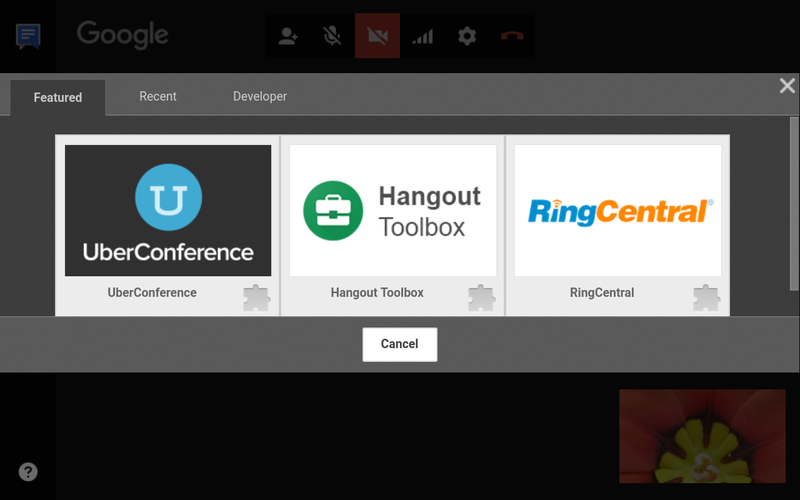 This removed most Hangouts video call apps, leaving only a few business and Hangout on Air-related apps running. Since 2015, these apps have only been available in Hangouts video calls launched from Google Calendar events or Hangouts on Air live broadcasts. And - notably - they require a Google+ Profile or Google+ Pageon the same account. What that means is that when consumer Google+ shuts down on April 2nd, and consumer Google+ Profiles are deleted, it is almost certain the remaining apps will no longer be available on consumer accounts. Note that the old desktop video call interface that supported Hangouts apps has not had a significant update (other than the removal of apps) since the newer desktop version of classic Hangouts launched in August 2015. Since 2016, development has focused on Hangouts Meet, which is currently only available for G Suite accounts. Google has stated that consumer Hangouts users will eventually be migrated to Hangouts Meet video calling, which has business features built in, but isn't any timeline for this transition yet. YouTube suggests that instead of a Hangout on Air you try the their built-in webcam live streaming, which works well for a single participant who doesn't require screen-sharing. And in the meantime you can continue to use Hangouts video calls on calendar events and Hangouts on Air without the apps. A look back at the development of Hangouts video calling and Hangouts on Air. Note the shift from "Hangout Parties" and social hangout out to more business-focused uses, plus a change in the technology that no longer supports Hangouts apps. June 2011: The Google+ Project field test launches, with Hangouts video calling. September 2011: The Google+ Hangouts apps is demonstrated with the Google Effects app, which lets anyone sport a mustache. Hangouts on Air launch, with limited availability. 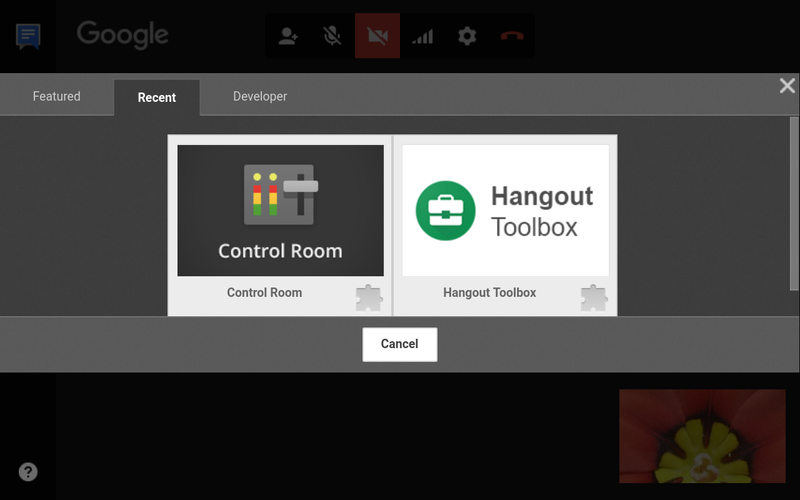 November 2011: Google+ Hangouts API v.0.1 first release . December 2011: Google Effects app lets anyone in the video call don antlers. Also this month Hangouts on Air were integrated with YouTube and got easier to launch. June 2012: : "The next generation of Social is in a Hangout" (Google I/O 2012) with a demo of some of the cool features. New Hangout video call apps introduced: throw a YouTube Party, Google Art Project, Story Before Bed, Symphonical and more. May 2013: Google+ gets the spotlight at Google I/O. Google launches a stand-alone Hangouts "that combines text, photos and live video across Android, iOS and your computer." You can download Hangouts from Google Play, the App Store, and the Chrome Web Store. It’s also part of Gmail and Google+. September 2013: Google+ Hangouts API last update. 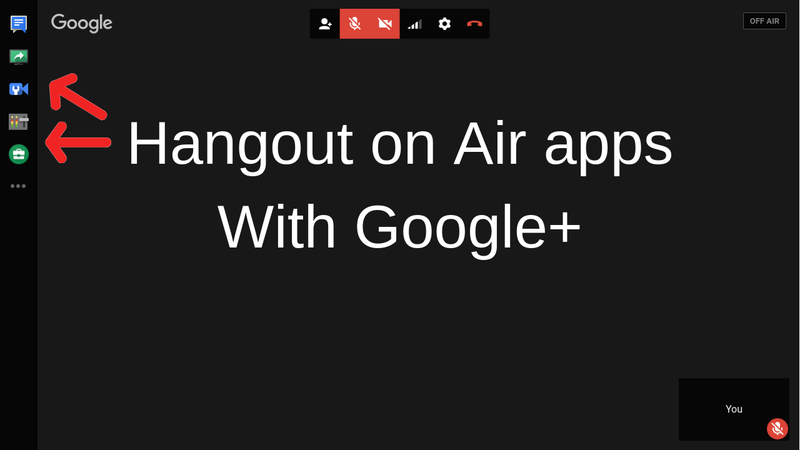 Live Q&A for Hangouts on Air launched. October 2013: "Broadcasters can now schedule Hangouts On Air, then promote them with a dedicated watch page. Once you're live, Control Room lets you moderate the conversation with eject and remote mute." November 2013: Google Helpouts launches, designed to connect regular users with experts over live video. 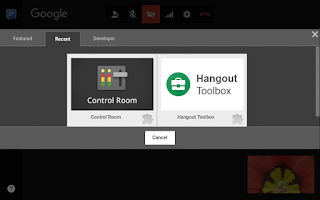 December 2013: Control Room app for Hangouts on Air rolls out. You can now launch a Hangout on Air from the YouTube Live Events manager and schedule a Hangout on Air Event in Google+ and add a trailer. Plus new buttons to start a Hangout video call or Hangout on Air from your own website. May 2014: Hangouts video call Draw app introduced, letting you draw on the people in the call. June 2014: Hangouts video calling moves to WebRTC, no longer requires a plugin in Chrome. Introduced the "Showcase" app in Hangouts on Air, letting you direct viewers to websites, merch, YouTube videos, Google+ Profile or Google Play content during a broadcast. Hangouts is now covered under the same Terms of Service that support other Google Apps for Business (now G Suite) products. December 2014: Major update to the Hangouts Android app, with video filters including sepia, vignette, and black & white. April 2015: Google Helpouts shuts down. June 2015: Full-view screen sharing launches in Hangouts video calls. July 2015: Google announces Google+ will no longer be the social layer across Google and will stand alone. This doesn't affect Hangouts, which hadn't required a Google+ profile for a year prior to this. August 2015: Hangouts Android app gets a new Material Design look and hangouts.google.com on desktop launches. You can cast from the Android Google Slides app to a Hangouts video call. September 2015: Capture (take a picture) app and filter app that let you adjust lighting are quietly removed. November 2015: "New Google" launched. The new design does not include Hangouts on the sidebar, but Hangouts on Air can still be launched from new Google+. Hangouts introduces new desktop video calling experience for consumers which is more reliable and "more streamlined" with no in-call apps other than screen sharing. Calendar Events for consumers and Hangouts on Air still use the older video call interface today. G Suite customers can invite Hangout video call guests who don't have a Google account. March 2016: Hangouts video calls launched from G Suite accounts can have 25 participants, up from 15. September 2016: Google announces "Meetings for teams" a new business-focused Hangout video calling experience. Hangouts on Air moves to YouTube. 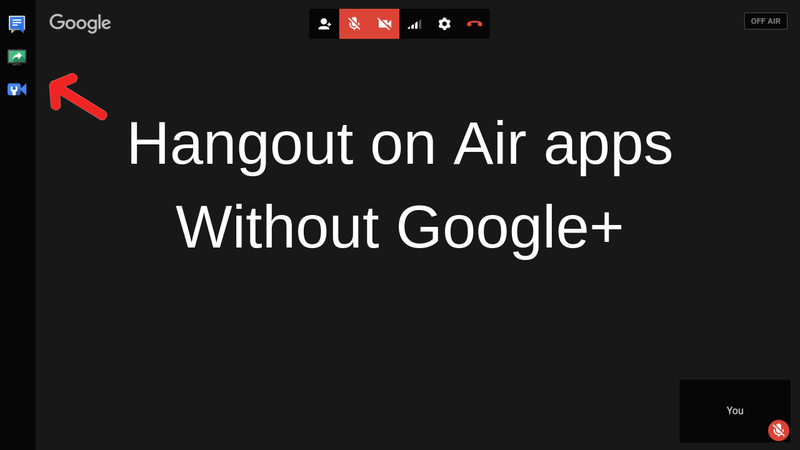 Google+-only Hangout on Air apps - Q&A and Applause - are no longer available. March 2017: Hangouts Meet, new enterprise-focused video calling, is publicly announced. April 2017: Google+ Hangouts API no longer supported, most remaining apps removed. The remaining apps are for business (Dialpad, RingCentral, Slack, UberConference) and Hangouts on Air (Hangouts Toolbox, Control Room, Cameraman). June 2018: Hangouts Meet compatible with other video conferencing systems, Skype for Business users can join Meet from the Skype app. September 2018: G Suite Enterprise customers can live stream Hangouts Meet video calls to in-domain users (not public, and not linked to YouTube). 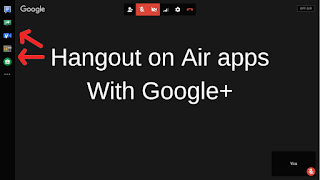 April 2019: Consumer Google+ shuts down, Google+ Hangouts video call apps are no longer available. Hi Peggy. This is very disturbing news to me. I count on control room especially to allow a panelist to control what the audience sees during my broadcast. I do have a GSuite account but you seem to indicate this may or may not be a solution. Thanks, as ever, for providing vital information on all the tools I use. You are a treasure! In the short term I think it's worth trying it out with the GSuite account. I would get that set up today if you haven't enabled live streaming for its channel. The down side is then you would either have to just create a playlist on your main channel, or re-upload those videos. I wouldn't expect Meet to have that option any time soon. Meet does currently offer internal live streaming to Enterprise customers, but that doesn't save to YouTube. In the future there may be more options, but that won't be for a while. I know a few people using Zoom who really like it, so that is definitely worth investigating. The User2User Community, which has regular Zoom help related discussions has moved from Google+ to Discord, and you might want to check it out. Hi, I'm Peggy K. I'm a Google Product Expert for YouTube, Google+, Blogger, AdSense, Hangouts and Google Fi. I share tips, tricks and updates for Creators of all types. The opinions here are my own and the instructions and tips are based on my own knowledge. Looking for help? Start here! Comments may be removed at the discretion of the blog owner. Spam and personal attacks are not allowed. If you would like to request permission to reprint an article, please use the contact form on the right menu.